The Spanish city of Pamplona became famous for many people thanks to the writings of Ernest Hemingway whose 1926 novel ‘The Sun Also Rises’ described his time at the the San Fermín fiestas. Today the capital of the Navarra region is synonymous with this annual bull-running festival. Yet there’s far more to the city that this crazy week in July which attracts around a million visitors. Pamplona originally served as a Roman camp then over the centuries developed as a fortress town protecting Spain from attacks from the Pyrenees. Evidence of its rich history is there for all to see and is a popular stop for pilgrims walking the French Way of the Camino de Santiago which passes through Pamplona on the way to Santiago de Compostela. Part 1 – Pamplona City Guide: General information for all visitors to the city including how to get there, where to stay and what to see and do. Part 2 – Pamplona Festival Guide: Useful information for people heading to Pamplona during the month of July for the annual San Fermín Fiestas. Part 3 – Beyond Pamplona: Pamplona is the capital of the autonomous region of Navarra which is surrounded by the Basque Country, La Rioja and Aragón. This section provides suggestions for anyone touring this area of Northern Spain. 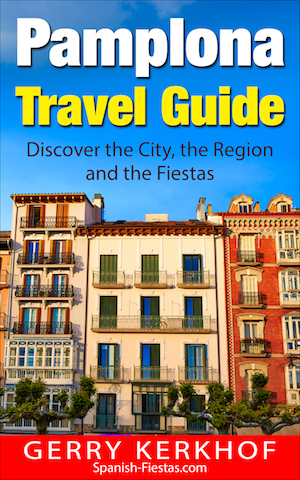 So whether you’re taking a city break to Pamplona, attending the bull-running festival or touring Spain, this eBook will provide you with valuable information to help you make the most of your stay.